Undoubtedly, it is everyone’s dream to have healthy, glossy, thicker hair. Hair fall is a problem most of us suffer from but there is a way to battle it. 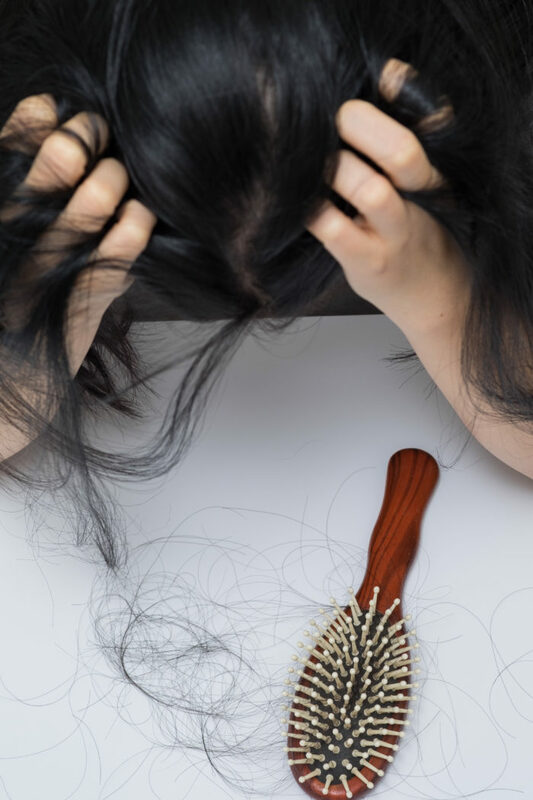 Though hair fall itself is a painless process, it becomes quite a discomforting one when you start to lose plenty of hair on a daily basis. Do not be worried to see hair on your brush. It is quite normal for old damaged hair to fall off to give way to new ones. But if happening on a regular basis and in alarmingly large numbers, it should be a serious concern. Lack of nourishment of hair, damage due to sun, extensive mishandling and not regular combing leading to lose strands, usage of harsh chemical hair products on hair, hair coloring and stylizing, lack of hair treatment for rejuvenation of hair, improper and diet habits, imbalance of hormones, ongoing medications that might increase hair fall temporarily, dandruff and scalp diseases such as alopecia etc. apart from these, stress and anxiety due can lead to hair loss in a tensed individual. Thyroid, a common problem witnessed among most women is another cause of loss of hair. If not given immediate attention, rapid loss of hair for a prolonged period of time can result in eventual baldness. Using a comb with wide tooth can prevent hair breakage and can sort tangles thereby actively reducing the loss of hair. It is advisable to prevent brushing of wet hair as the chances of hair loss from wet roots are more. One must wait until the hair is partly dry before combing it. Vigorously rubbing hair with a coarse towel can do more damage than perceivable by the naked eye. It makes hair strands weak over time and hence yields them prone to further damage. Besides, it takes away the luster of healthy hair. Keeping hair clean is perhaps the primary measure to be taken in order to keep hair strong and long. A sure indication that hair needs to be washed every so often is a dirty comb. Just as hair should be washed about three times a week with a mild shampoo that suits the hair type, the comb should be rinsed with warm water and soap. Using suitable hair products as per the nature and quality of one’s hair is another factor that determines the rate of hair loss. Using damage repair shampoo for broken degraded hair, applying conditioner on dry hair, using a serum if needed are methods to prevent hair fall. If hair is healthy and nourished with appropriate keratin replenishing methods it is sure to be strong and shiny. Drab dull hair is more vulnerable to breakage due to undernourished hair strands. Consuming iron-rich foods not only helps in blood circulation throughout the body but also blesses hair with a healthy look. Also, be gentle with your hair while combing. Oiling the scalp as part of one’s routine is a definite healthy habit that fosters hair growth besides reducing hair damage and consequent breakage. Using appropriate hair products such as conditioners, hair packs, hair serum go a long way in yielding hair of better quality. It is best to go for natural products instead of subjecting harsh chemical treatments. Practices such as ironing and coloring of hair should be refrained from as they deteriorate the quality of one’s locks. These are effective means to combat hair fall and if followed with oiling of hair with coconut or other hair oils such as olive, jojoba, tea-tree, sesame and castor oil, one is sure to receive outstanding results. Massaging hair with warm oil helps circulate blood in the scalp and makes brittle hair healthy, bouncy and soft to touch. Paraben-free hair products without sulfates and silicones are best options for hair care. As a simple but effective way to prevent hair from falling off, it is safer to tie hair lightly instead of tight ponytails. Clean, well-conditioned, frequently oiled hair stays better, looks better. Next articleLose Weight, Not Your Mind!